Sisko was born in 2332 in New Orleans, Earth. His mother had been possessed by a Prophet – a non-linear alien species which lived in the then-undiscovered Bajoran wormhole. The Prophet had used Sarah Sisko to ensure the birth of Benjamin, who would later become the Emissary of the Prophets. A year later, the Prophet returned control of Sarah's body, and she left her son and husband. Joseph Sisko soon remarried, and his new wife posed as Benjamin's biological mother all the rest of her life. She gave birth to his sister, Judith, and at least two brothers. During his childhood years, Sisko and his siblings were taught to cook by their father, who believed that replicated food was lacking. Joseph owned his own restaurant, Sisko's, where his children worked in the summers. Joseph called his children his "taste-testers", and insisted that they all eat dinner together. Sisko had a crush, as a teen, on Neffie Beumont and dated Zoey Phillips for three years. 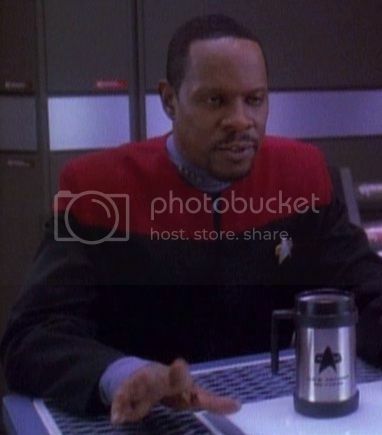 Sisko joined Starfleet Academy in 2350. During the first few weeks, he beamed back to New Orleans every night for a family dinner. Sisko studied to be an engineer. During his sophomore year, he performed his field study at Starbase 137. He later considered it to be one of the best experiences of his life. During his years at the Academy, Ben became friends with Calvin Hudson and Laporin. He also met his future mentor, Curzon Dax, at Pelios Station. Sisko also became the captain of his Academy wrestling team. He once challenged a Vulcan, Solok, to a match after a few drinks in the Launching Pad. He lost, was humiliated, and resented Solok for decades. After graduation in 2354, while waiting for his first assignment, Benjamin met a woman named Jennifer at Gilgo Beach. Still in 2354, the two fell in love, were married and moved to Benjamin's new posting at New Berlin. Together with Cal and Gretchen Hudson they attended the local Mazurka Festival where Benjamin was remembered for dancing in German lederhosen. Their son, Jake, was born a year later in 2355. Sisko was reunited with Curzon Dax when the two served together for a few months aboard the USS Livingston. Dax became Sisko's mentor, and the two were friends for over a decade. Benjamin later served on the USS Okinawa during the Tzenkethi War. At the time, he was more interested in engineering and ship design than command. However, Captain Leyton noticed potential in young Sisko, and promoted him to lieutenant commander, making him the ship's executive officer. Sisko transferred to the USS Saratoga, and also served as the first officer. Both Jennifer and Jake lived with him aboard the vessel. In early 2367, the ship was operating close to Earth, and was called to join a fleet at Wolf 359 to defend the Sol system from a Borg attack. The Battle of Wolf 359 was a massacre. Thirty-nine of the forty starships assembled there were destroyed. The Borg damaged the Saratoga, forcing the crew to abandon ship. Sisko found his son and wife, but his wife had been killed in the attack. He was forced to leave her as the ship suffered a warp core breach. As late as 2369 Sisko blamed Jennifer's death on Jean-Luc Picard, who had been assimilated by the Borg as Locutus of Borg and had carried out the massacre at Wolf 359. Sisko was faced with the loss of his wife and raising his son alone. He found an outlet for his pain in his new posting at Utopia Planitia Fleet Yards on Mars. There, Sisko worked on the prototype USS Defiant – the first in what was to be a fleet of warships to defend the Federation from the Borg. After work on the project slowed, and design flaws became apparent, the project was mothballed. This left Sisko on the verge of resigning his commission. He intended to work on Earth, constructing orbital habitats, but struggled with the decision to leave. As he was contemplating his next move, his former captain, Leyton, nominated Sisko for a command position. Promoted to commander, he was assigned to Bajor, original home to the Prophets who had caused his birth. There Sisko was to command the old ore processing station Terok Nor, built by the Cardassians during their occupation of Bajor, then abandoned as part of their recent withdrawal from the system. Under Federation control, the station was newly christened Deep Space 9. It was to be Sisko's responsibility to help prepare the Bajorans for entry into the Federation. Arriving on DS9 in early 2369, Sisko was briefed by Jean-Luc Picard, whom he still blamed for his wife's death. A t this point, Sisko told Picard he intended to resign. However, he continued his work, and assumed command of the station. Sisko's crew slowly arrived, and it was then that he met his future friends, Bajoran liaison and second in command Kira Nerys, security chief Odo, Doctor Julian Bashir, and Chief of Operations Miles O'Brien. He was also reunited with his old friend Dax, living in a new host, Jadzia. The situation on Bajor was hostile, as factions vied for control in the new Bajoran Provisional Government. Sisko learned that the only way to unite them all was to call on the Bajoran spiritual leader, Kai Opaka. Sisko met with her in a secluded area of Bajor, and she told him that he was to be the Emissary of the Prophets and was destined to discover the Celestial Temple, home of the Prophets. Sisko returned to the station and with the help of Dax, began studying everything known about the Celestial Temple. Eventually they discovered an unusual area in the Denorios belt. Traveling there, they were surprised to discover a stable wormhole. Dax was sent home by the Prophets, but they met Sisko, who explained linear existence to them. While talking with the Prophets, Sisko was forced to come to terms with his wife's death, and he returned to Deep Space 9. Sisko forgave Picard for his actions as a Borg, and informed him that he would stay in Starfleet. Sisko now had the strange task of commanding a station of Bajoran officers, many of whom revered him as a religious figure – their prophesied Emissary. Deep Space 9's position at the mouth of the Bajoran wormhole made it a key location. Exploration and business opportunities were opened to the distant Gamma Quadrant, and DS9 became a wayport for ships and people from all over the quadrant. Sisko began encouraging Bajorans and merchants on the Promenade to stay on the station, in order to shape DS9 into a thriving community. He even approved the formation of a school on the station. Sisko had to put all his training and skills to use, as he was forced to balance command, diplomacy, his home life, and his new position as a Bajoran religious icon. Sisko made first contact with the first species to come through the wormhole from the Gamma Quadrant, the Tosk, in 2369. He acted as defense in the extradition trial of Dax to the Klaestron government, and proved her innocent. He fought in the war between the Ennis and the Nol-Ennis on the planet where Kai Opaka was stranded. Constantly dealing with Jake's friendship with a Ferengi boy, Nog, proved to be a challenge. But his most difficult tasks were preparing Bajor for life in the Federation, and dealing with his title as the Emissary. During late 2369, tensions on the station rose between Bajoran and Starfleet personnel. Scientific teachings about the nature of the Bajoran wormhole conflicted with the religious beliefs of much of the Bajoran population. Sisko struggled to keep the peace, and in the process had his first meeting with Vedek Winn Adami. Months later, internal pressures on Bajor exploded. A terrorist group called the Alliance for Global Unity – also known as the "Circle" – tried to seize power, under disguised support from the Cardassian Union, and sought to break off relations with the Federation. Starfleet was forced to abandon the station, but Sisko stayed behind, eventually proving the Cardassians' involvement with the Circle, which allowed power to quickly return to the Bajoran Provisional Government. Sisko was also forced to deal with internal pressures within the Federation as well. When the Federation-Cardassian Treaty of 2370 caused several colonies in Federation space to come under Cardassian rule, many colonists felt the Federation had abandoned them. They formed the Maquis, a terrorist group operating out of the Badlands. Sisko's old friend Calvin Hudson was assigned as the Starfleet attaché to the colonists in the Demilitarized Zone but became a Maquis leader. Several other Starfleet officers resigned to take up the Maquis cause. Sisko felt angered by the actions of these officers, and felt the pain of personal betrayal by Cal Hudson. In 2370 first contact was made with a group of Changelings known as the Founders. The Founders were the Gamma Quadrant version of the Federation and peace talks began. Sisko's life was turned upside down in 2372 when he was stuck on the Prometheus when it forced to slide from his home quantum reality. Arriving in the Prometheus' home quantum reality he was assigned to command Starbase 16 along with the double of Jennifer Sisko from a different quantum. The two of them hooked up on Prometheus despite the fact that they were using the other to replace the one they lost. He was promoted to Captain in 2375 about four months before his double disappeared. In 2379 he was transferred to the USS Planck to be it's CO and a part of Project Full Circle.